Flores, Leonardo. "The I ♥ E-Poetry Guide to "Electronic Literature & Its Emerging Forms.'" I ♥ E-Poetry. 3 Apr. 2013. Roundabush, Jennifer. "Electronic Literature Showcase at the Library of Congress" Hyperrhiz: New Media Cultures 10.0. Fall 2013. Szilak, Illya. "Books That Nobody Reads: E-Lit at the Library of Congress." The Huffington Post. 25 Apr. 2013. We would like to thank the Digital Reference Section, CALM Division, Library of Congress, for sponsoring the Electronic Literature Showcase. For more information about the exhibit, contact Dene Grigar, dgrigar@vancouver.wsu.edu, or Kathi Inman Berens, inmanber [at] usc [dot] edu. 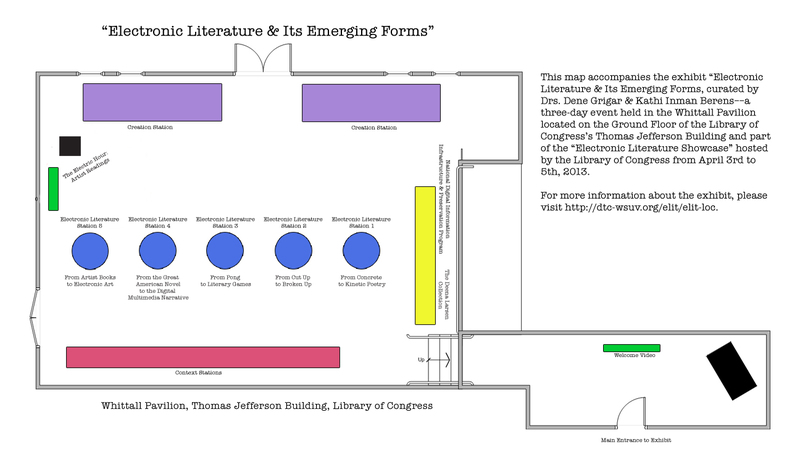 For more information about the Electronic Literature Showcase, contact Susan Garfinkel, elit@loc.gov. © 2019 Electronic Literature and Its Emerging Forms. Theme: Ari by Elmastudio. Proudly powered by WordPress.